Why his candidacy is more flawed than you think. This week, Tim Pawlenty formally launched an exploratory committee to run for president. His path to the GOP’s 2012 nomination is reasonably clear: He will try to become everybody’s second choice in a field full of deeply flawed candidates, and there’s a fairly convincing case that he’ll succeed. Strikingly, though, this case for T-Paw in 2012 is essentially the same as the case that was made for Pawlenty as John McCain’s running-mate in 2008. He was a pleasant guy from a battleground region of the country, with a successful state-level political career, who didn’t offend any of the major veto-wielding factions within the Republican Party and the conservative movement. He also had a suitably all-American biography and once devised a slogan—“Sam’s Club Republicans”—that nicely reflects what Republicans like to think about themselves. But it’s also useful to remember why John McCain did not in fact put the Minnesotan on his ticket: When it came down to a choice between Pawlenty and an obscure Alaskan named Sarah Palin, it was obvious that Pawlenty didn’t move the needle in terms of the GOP’s prospects for victory. “Pawlenty was credible and acceptable, but once the convention was over he would disappear,” thought McCain’s advisers, according to one insider account. Palin, on the other hand, was the “high risk, high reward” candidate, who would energize the GOP base. You see which one got the nod. Of course, the situation was different from today. McCain was trailing in the polls when he made that decision, and choosing Pawlenty as a running-mate would be a very different calculation from choosing him as a presidential nominee. Yet there are nevertheless some lessons to be drawn from McCain’s choice, which highlight Pawlenty’s weaknesses as a candidate: Yes, his ability to appeal to all factions within the conservative movement might help Pawlenty in the “invisible primary,” where party elites attempt to set the field and tip the scales for their favorites. These elites seem to be hoping that if they choose someone who appeals to all sides, and cuts a profile as close to “generic” GOP candidate as possible, they will have a winning hand next year. But are the conservative activists who actually dominate primary and caucus events really in the mood for a safe, unexciting choice? Or are Tea Partiers in the mood for a crusade, led by someone who can energize them as Palin was meant to do in 2008? Will a political movement that perceives itself as “taking the country back” from socialists and baby-killers really find its general in a man so unremarkable that he was described in a sympathetic home-state magazine profile as “The Cipher”? This problem goes deeper than the usual questions about Pawlenty’s “charisma.” He is, by most accounts, a personable guy who can connect well with all sorts of people, a quality that will serve him well in one-on-one retail campaigning. But the real issue is whether he is “big” enough for the role of the next Ronald Reagan—is he a redemptive figure who seems like he can lead this most exceptional country back onto the path of righteousness? This is an unusual requirement, but to conservative primary voters, who are long aggrieved by what they perceive as endless betrayals at the hands of Republican politicians, it is an essential quality that Pawlenty hasn’t definitely shown he possesses. But they have the very serious goal of elevating Pawlenty from the non-offensive “safe choice” of party insiders into a sort of Maximum Leader for whom conservatives will snake-dance to the polls next year in order to vindicate their long-frustrated ambitions. 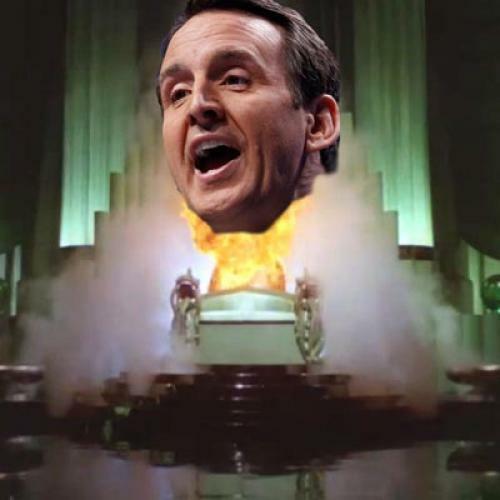 This gambit, handled as it is now, exposes Pawlenty not only to liberal ridicule, but to the risk that he will be perceived in the end as a Wizard of Oz—a nebbish pretending to be a world-historical figure via the use of smoke and mirrors and amplification. Yes, in theory, he could win the nomination much as McCain did, through a demolition derby that incrementally eliminates his opponents. But it’s clear that he still has a lot of very tricky rebranding to do—and for your typical Iowa Caucus-goer, conscious of his or her responsibility to choose or reject candidates, and yearning now more than ever for a leader who is larger than life, T-Paw’s modest “generic” charms may simply not be enough.